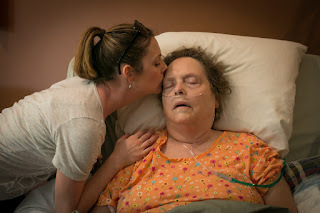 I mentioned in a recent post that my mom seems to be near to death--which for her, I believe would result in complete healing as she goes to be with Jesus. She was diagnosed with a disease that is rare, untreatable, and terminal (without a cure). This disease is CJD (Creutzfeldt-Jakob disease). 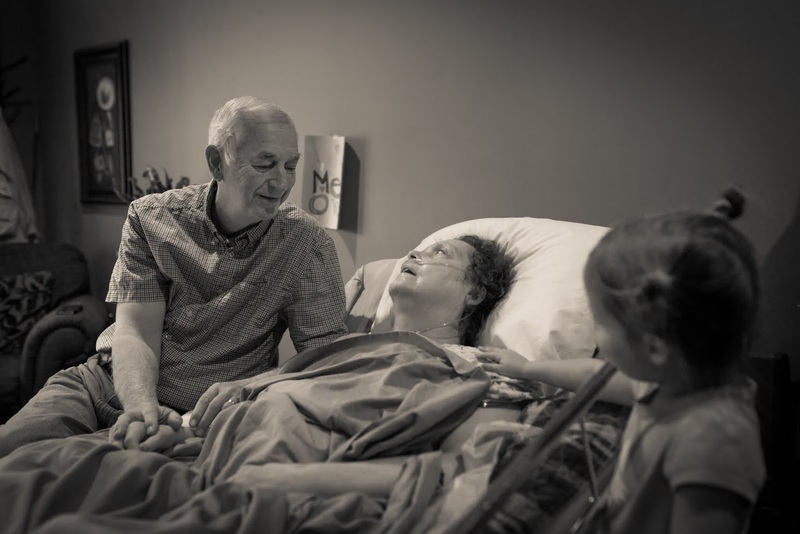 And, unfortunately, the disease progression is so rapid, that by the time we realized what she was diagnosed with, it was too late to ask her the many questions I just figured that someday I would ask her. About 6 months ago, I tried to ask her some of these many questions that had always been on my mind. They were not super important questions, but they were just simple things that would tell me more about who my mom really was. For example, what were her favorite toys growing up? Honestly, I do not even know my mom's favorite meal. I could guess, but I never asked, so I don't know for certain. Anyway, I tried to ask her a long list of questions, but the only response she could give me to each question was, "I don't know." It was too late to discover the answers and I will never again be able to hear the answers from her mouth. Thankfully, her siblings are all still living, so I can ask them some of the questions about her childhood and perhaps try to piece some things together. But, it isn't the same as hearing it from her precious mouth. I would highly recommend to everyone to interview your parents! If you need ideas of interview questions, just google it-there are many examples. Here is a great one: http://www.legacyproject.org/guides/lifeintquestions.pdf. 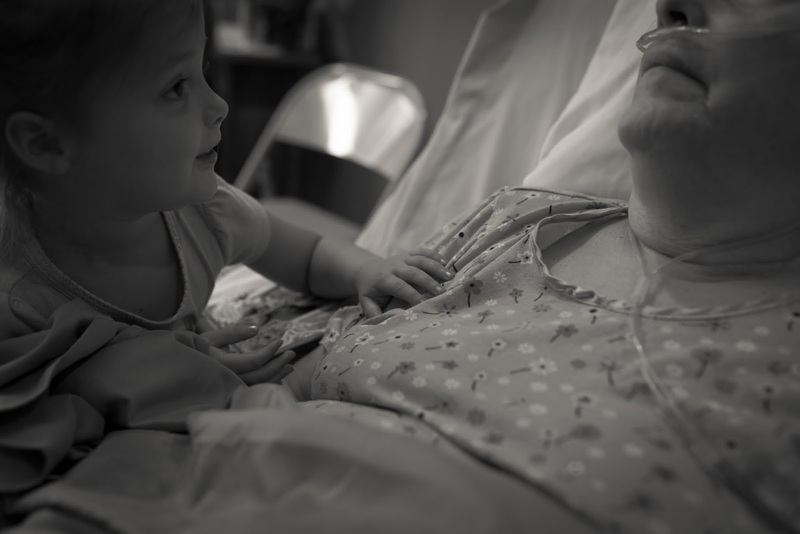 On Friday afternoon (10/2), my dad had called me because my mom wasn't doing well. 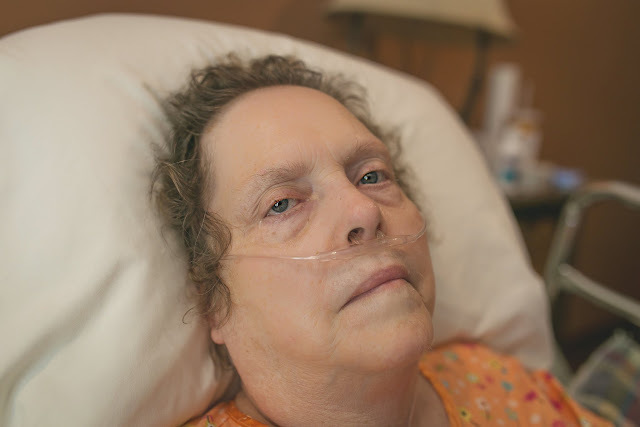 She wasn't talking, eating, drinking, or swallowing, and it appeared she had aspirated fluid into her lungs. 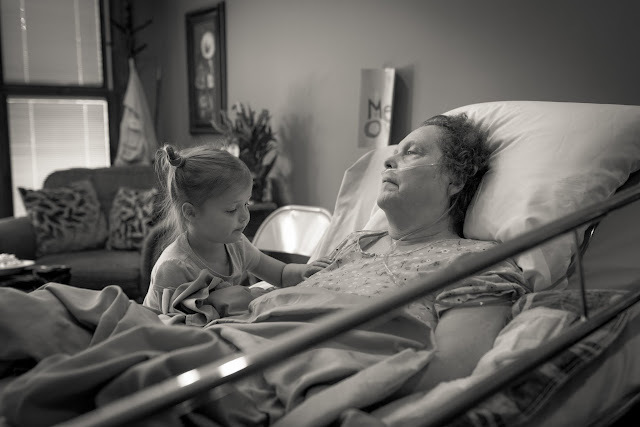 The hospice nurse frankly told my dad that she didn't believe my mom would make it through the weekend. When he told me this, I wanted to immediately drop everything and head that way. But, we had out of town visitors headed to our home for Luke's party on Saturday, as well as many other party guests. I had to make a tough decision on whether to cancel Luke's party, which he was really looking forward to (and had been for months), or to leave right after the party. We chose the latter, and I felt very guilty about doing it. I am pretty sure I would feel guilty with either decision that was made--someone would be let down either way. However, in hindsight it was the right decision. My mom's condition began improving remarkably, and I even Skyped with her on Friday night at 10:45, after texting one of my brothers and finding out that she was talking. I had already told her earlier that day on the phone that I would be seeing her on Sunday. I told her again that I couldn't wait to see her soon! I didn't get an ounce of sleep that night, with so much on my mind. I called and talked to my mom again the next morning. I was so excited to see her the following day, on Sunday. I made sure to tell her that! I got to experience the blessing of Clarehouse firsthand, as we headed there on Sunday morning, 10/4. That day just happened to be Luke's 6th birthday, so we even had a little party for him there. Although my mom's brain does not work well right now, she is able to recall the lyrics of most songs she knows. I watched her as we sang "Happy Birthday" to Luke--she lip-synced every word! Due to the circumstances, Drew was able to work remotely. So, he worked at my parents' house last week, while the kids and I hung out at the Clarehouse with my parents. 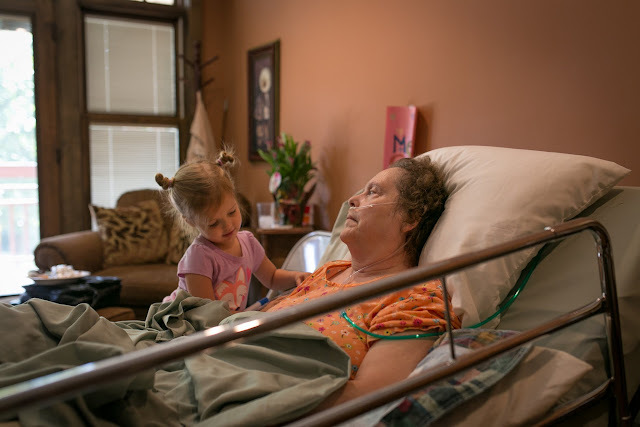 The Clarehouse has a beautiful nature trail, a gorgeous chapel, and huge rooms, each of which has a balcony and even a nice bed for guests of the patients to sleep on. Also, volunteers bring delicious meals there most days of which the patients and their visitors may partake. And, there are tons of snacks for patients (who can eat) as well as their guests. So, it was pretty easy to make this place our home for the day while we were in town. We would usually arrive in the morning to the Clarehouse, complete our school work (thank goodness for homeschooling! ), spend some precious time with my mom, and then leave for a couple of hours around lunch. Nature journaling inside the "chapel." While on our nature walk, Abbey found a cool leaf to make an imprint of later. I needed to let the kids run around and be kids for a couple of hours, otherwise, the afternoon wouldn't go so well. We would come back after lunch to spend a few more hours with my mom before dinner. The weather was beautiful last week. 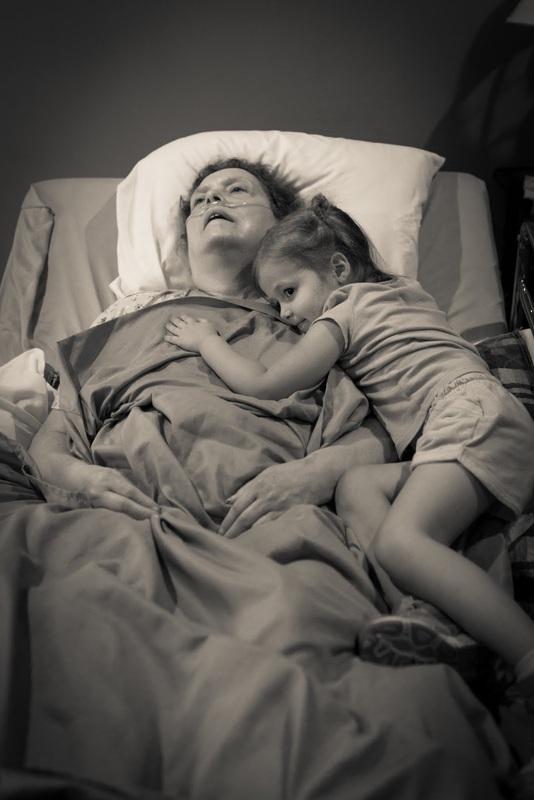 One afternoon, we wheeled mom's bed out onto her balcony, so she could get some fresh air and sunshine. I tried to balance spending that quality time with my mom and dad with caring for and teaching Luke and Abbey. Of course, I desire to spend as much time as possible with my mother, as I know time is limited. It is so tough living so far away! While I was there, my mom began talking, eating, drinking, and her lungs no longer sounded congested. I asked the doctor, who came in to visit my mom on Wednesday, what he thought of my mom's condition, which seemed to be improving (when the nurse thought on Friday she would not make it through the weekend.) He asked if there were any visitors who visited recently, that she may have been looking forward to seeing. Of course I replied, "well, we live out of town and I told her on Friday we were coming to visit." He said that very well could have been enough for her to "rally." He said it is pretty common for patients to use all their energy to improve so that they can spend time with loved ones. I love my sweet mom so much! Luke prays for her every night. He speaks about "when she is healed." 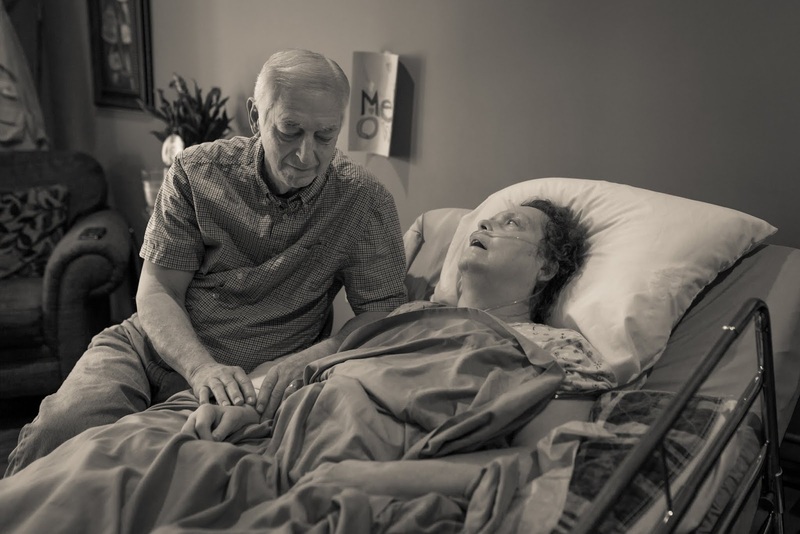 I wish I had the faith that he has--the faith that fully believes in her healing. Miracles do happen! 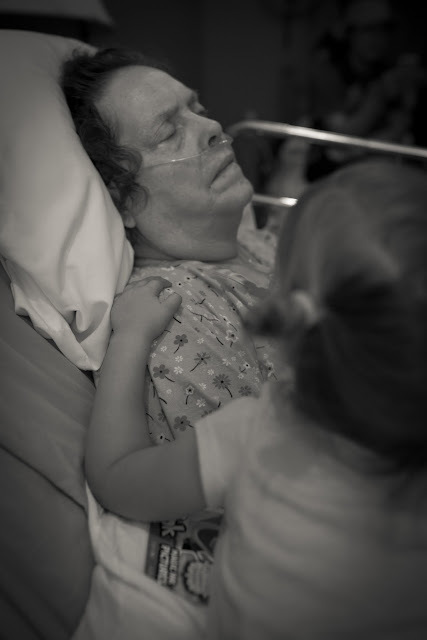 It is just so difficult to see her in her dying state, and have that faith that she can be completely healed. But, it is definitely possible. It has happened before in history. My dad was making my mom smile in this picture. It is hard to tell here, but I could tell my mom loved it when Abbey cuddled up next to here. My sweet mom. I feel like she communicates with her eyes. They are a window into her soul. Those beautiful blue eyes would look so deeply into mine, as if she were trying to talk to me with them. I just stared right back, as if to communicate, "I love you" back at her. I could have sat here forever, just staring into her eyes. As I did so, I thought about how many more opportunities I may have to look at her, eye to eye. I fear those moments are limited. I yearn to be right by her side so much! It is so tough to be a mother (and teacher) of little ones, living far away from the rest of my family, while also having the strong desire serve my parents. We had to come back home to take care of some things at our house, and let the kids participate in some of their activities they are involved in (as they missed them last week). But, we will be back very soon. In the meantime, I am so thankful for Clarehouse for my parents--it is a place that is very inviting for visitors. And, my parents have had visitors pretty much non-stop--my mom and dad are loved by so many! I am thankful for all the family and friends who can be right by their side, especially in the times when we cannot be there as we wish.